Notes on Public Art (Now) and Jeremy Deller at the Bristol Art Weekender 2014 …. A wander round any metropolitan or even rural area reveals that art is truly established in the public realm, but it takes something special to elevate it within public consciousness. For the launch of a public art programme that rewrites the rules, Jeremy Deller was probably the perfect speaker. With a practice that follows lines of interest and investigation rather than conforming to classification by media, he explores the creative and political life of Britain creating situations that require a response rather than making a statement himself. When we arrived in Bristol there was a real buzz as people enjoyed their city, work-free, in the sunshine, making the most of what was on offer. We slipped into John Wesley’s cool and elegant New Room ahead of Jeremy Deller’s Sunday Service, the contrast was palpable. As the audience began to arrive the atmosphere of excitement and activity from The Bristol Art Weekender spilled in too. Perched right at the front of the chapel we were quickly surrounded by artists and dedicated Deller fans, but across the chapel the audience was made up of a range of old and young, dedicated art insiders, the culturally informed and curious. That was just Bristol, across the world from New York to New Zealand more people were also waiting to listen, linked up by a live web feed broadcast by this is tomorrow. The New Room is a space originally intended for use not only by religious societies but also as a medical dispensary, meeting place and school room, making it the perfect setting for this international congregation to gather for our Sunday Service. 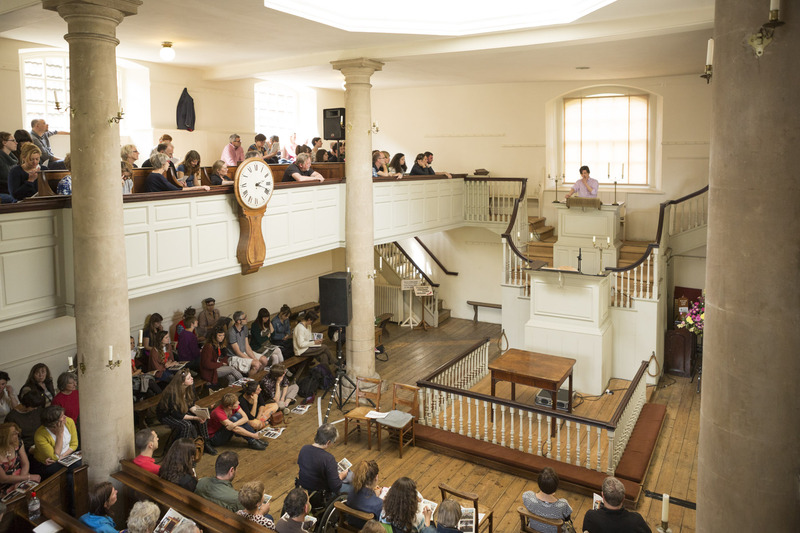 Claire Doherty and Jeremy Deller took to the pulpit, 12ft above the audience, it was evident that this would be more of a conversation than a sermon as the hushed silence in the chapel was punctuated with frequent laughter. Deller delivered a chronological overview of his career, following the beat of the sermon sheet, we travelled from the first exhibition at his parents house where the toilet hosted graffiti from the old British Library to a painting of a Range Rover in the grips of an endangered Hen Harrier. As Deller directed us through his oeuvre, perhaps the most interesting thing that he revealed about his practice is that it doesn’t aim to appease or heal – his Battle of Orgreave re-enactment wasn’t about bringing the community together but about re-activating the memory, shaking things up. Just as touring the bombed out Iraqi car through America was not intended to be an anti-war piece, but a conversation starter. Working with an Iraqi citizen and an enlisted US soldier, he purposefully toured the car to the southern states and Republican areas of America creating an emotive mix with the potential for fireworks. 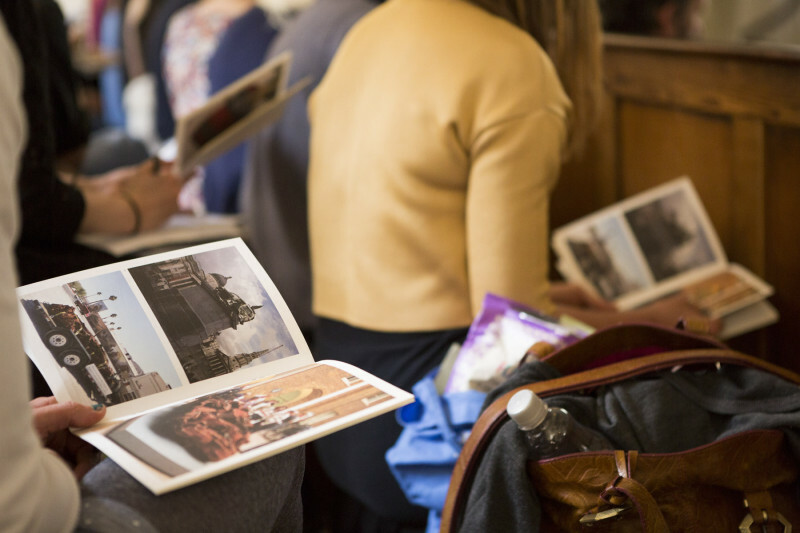 However, the most frequent questions it invoked were “what kind of a car was it?” and then “did anyone die in it?” There was a sense that the experiences and responses from the participants were so much more valuable than any reception from the art world. Deller talked about the excitement of public participation and the artist’s lack of control; without the structure of an established arts space, the audience’s behaviour and the filtering of opinions are no longer structured. It seems fitting that the initiation of a new way of thinking around public art takes place outside of the gallery. That day the message was communicated globally, from the high church of technology; live broadcast,social media to more traditional means; the power of the spoken word, the tangible quality of a service sheet. At the end of the talk the majority of the audience filed out to check out Luke Jerram’s Park and Slide, or catch the last performance of Annika Kahrs’ A Concert for the Birds, but a few of us lingered. A cluster of fans waited to meet the man and have books signed. Deller patiently attended to each audience member, answering questions, discussing his work and their ideas. It became clear that if an artist is working so prominently in the public realm there is a certain expectation/need for their presence as celebrity. It seems difficult to place work into the public realm without the artist’s presence joining it; Tracey Emin’s views on taxation make the news and Grayson Perry’s regular appearances on Have I got News for You and his delivery of The Reith Lectures have permeated into public consciousness. Deller rarely appears in his own work and yet he has developed a bankable public image, with a front cover on Fantastic Man and images popping up across mainstream media; the Times, the Guardian, Time Out and the FT. The culture of celebrity often means that the maker is more accessible than the made; you don’t have to have any arts knowledge to form an opinion on a person. The high profile nature of major artworks marks the continued crossing of art from exclusive to open to all; with a lot of arts funding requiring links to the community there is a need for emerging, grassroots arts practices to tackle and engage with their audience through the work or develop extensive interpretation. It will be interesting to see which ideas from Public Art (Now) filter into the consciousness of policymakers in the public realm – changing the expectation of what art can be – involving makers and cultural explorers from every echelon of society, from the artist led space to community project and onto the columned doors of the big institution.